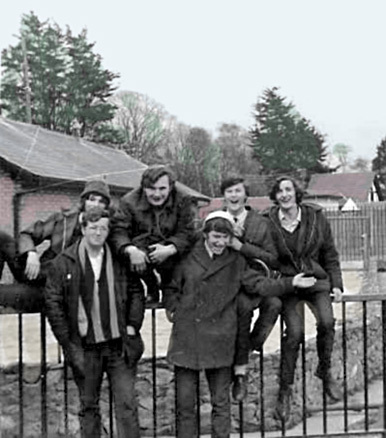 Martin Murphy, Brian Martin, Eddie Fitzgerald and Michael Miller). where I studied Philosophy under the guidance of Fr Eugene Lewis. we had a great day with plenty of laughter . . . .
Michael Miller and myself went on to do our Novitiate in Fribourg, Switzerland. in Dublin but is now living in Strasbourg. Can you identify these three WFs ? (the WFs' parish in which we grew up). for Heston parishioners in those days. This would probably have been taken in the mid-50s. Is that a stable door on the left ?
" 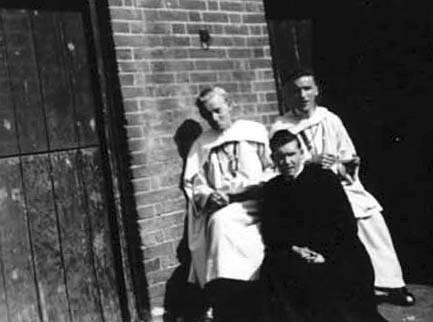 This photo shows Fr John Stanley (on the left) and Fr O'Donnell. In front of them is Tom Bradley (now Fr Bradley in Dublin). Hall, but I don't recognise the background of the picture. "